I love the ‘90s, and one of my favorite examples of ‘90s music are the final records of the Screaming Trees: the graceful, melancholic SHADOW OF THE SEASON and the blues- and gospel-influenced DUST. Alongside the Afghan Whigs (whose lead singer appeared on BUBBLEGUM, Lanegan’s most acclaimed solo album), the Trees brought a smooth and soulful touch to the rough edges of grunge, although they were not interested in painting depravity as fun like the Whigs were. Sadly, constant infighting and frontman Mark Lanegan’s drug and confidence issues lead to the band’s breakup to 2001. 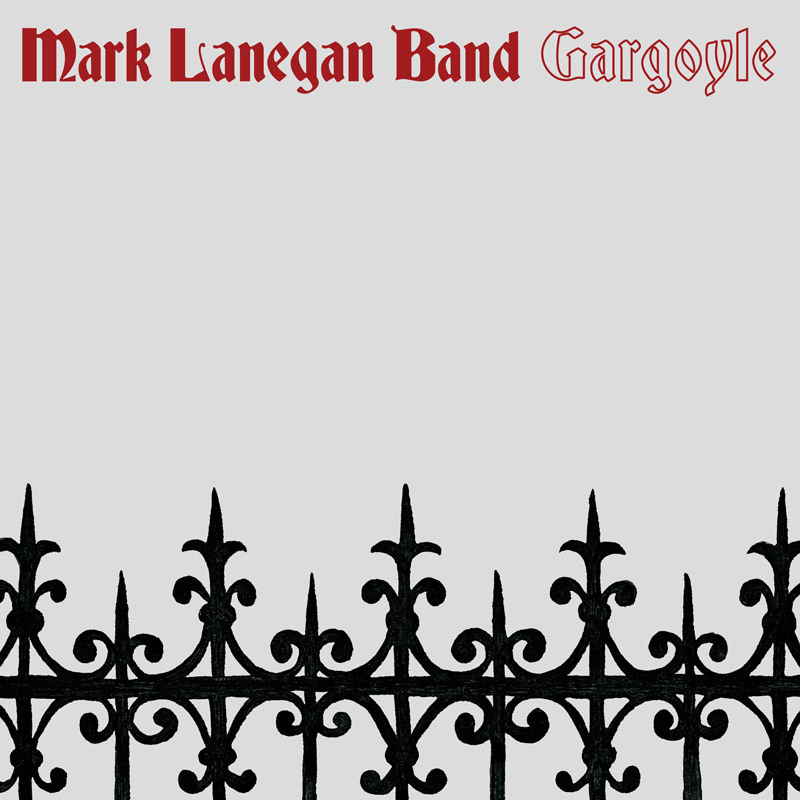 Even before their breakup, however, Lanegan was producing solo records and gaining a lot of goodwill within the rock world, leading to work with members of Alice in Chains and Pearl Jam in Mad Season, and contributing vocals to every post-debut Queens of the Stone Age record. Lanegan has repeatedly stated his unhappiness with the Tree’s pre-SHADOW records, many of which are rather bland, unmemorable garage rock. In some ways he’s a man out of time, with far more in common with dark, velvety blues singers of the ‘60s and ‘70s than the loud, crazed, in-your-face rock stars that dominated the ‘80s. Nonetheless, after one too many sorrowful solo albums, Lanegan decided to switch things up on PHANTOM RADIO, dabbling in folktronica and synthetic drum beats. GARGOYLE finds him once again stepping out of his comfort zone into something more reverb-soaked and synthesizer-heavy. The risk pays off, due to Lanegan’s rich voice and a series of atmospheric yet catchy tunes. The album has two types of songs: up-tempo yet dark tunes with buzzing guitars and echoing bass like “Death’s Head Tattoo,” or washed-out ballads with more minimal instrumentation like “Sister.” The synthesizer and electronic elements have come forth to compete with the guitars for who gets to be the dominant instrument, but neither causes the other’s sheen to diminish. For a relatively new instrument to Lanegan, the synths are called on to play a variety of roles, like the more organ-like dramatic notes on “Blue Blue Sea,” but they are a welcome addition. This isn’t the breezy, new wave side of post-punk; it’s heavy, pensive goth rock akin to The Sisters of Mercy. However, The Sisters always dragged on too long and couldn’t compose a decent song to save their lives, while Lanegan certainly can. The mixing deserves special attention as well, as it does a great job balancing the layers of guitars and synths while still maintaining a chaotic soundscape. Lanegan’s best musical gift has always been his deep voice, which sounds just as amazing now as it did 25 years ago. It’s the perfect blend of sweetness and grit that infuses every word with so much more weight and experience. He has impressive control and never comes off as whiny or pissy, which could have easily happened as he sings “Goodbye to Beauty,” a sentiment only the most convincing vocalist can pull off. The transition to gothic rock makes perfect sense for Lanegan and his sensual baritone, and I’m somewhat surprised it hasn’t happened sooner. Much like the worst songs from the aforementioned Sisters of Mercy, GARGOYLE becomes a little too indulgent at times, living the listener hungry for less brooding and more action. “Sister” and “First Day of Winter” suffer from a severe lack of momentum, and would have benefitted from a little guitar to add some punch to them. However, album closer “Old Swan” does the best job of combining the two halves of the album, taking the moodiness of those two tracks but giving it a more kinetic, urgent tempo that ends on an effectively haunting 90-second long outro. Without it, GARGOYLE would have felt too predictable. Even if they are somewhat obvious things, it’s great to see Lanegan still trying new things after so many years when other similarly experienced artists would just coast by on brand recognition. He has refused to stick to his expected formula completely, delivering the same great mood but in a different yet still enjoyable way. Unqualified, unfiltered, unbiased, but not uninspired reviewer of whatever these people tell me to review.